Traditionally designed in a Renaissance style and named after Shakespearean actor David Garrick, the Garrick Theatre first opened in 1889. Since then, the theatre has become synonymous with hosting short-run melodramas and comedies. One of the West End’s smaller venues, the theatre has a lavish interior decorated in reds and golds, with elaborate cupids hanging down either side of the proscenium arch pillars. With a seating capacity of 732, the Garrick is a relatively intimate venue that offers a variety of views. Split across three levels, including the Stalls, Dress Circle and Grand Circle, support pillars and row curvature could contribute to some difficult sightlines! Sit in the Dress Circle for the best overall view of the stage, with bargain seats to be found in the Grand Circle. Sit in the Stalls for a premium view, although avoid sitting too close as the stage is very high, and the rear of the Stalls is mostly restricted. Check out our seating price chart below, which helps you find the right type of view for your ticket price. 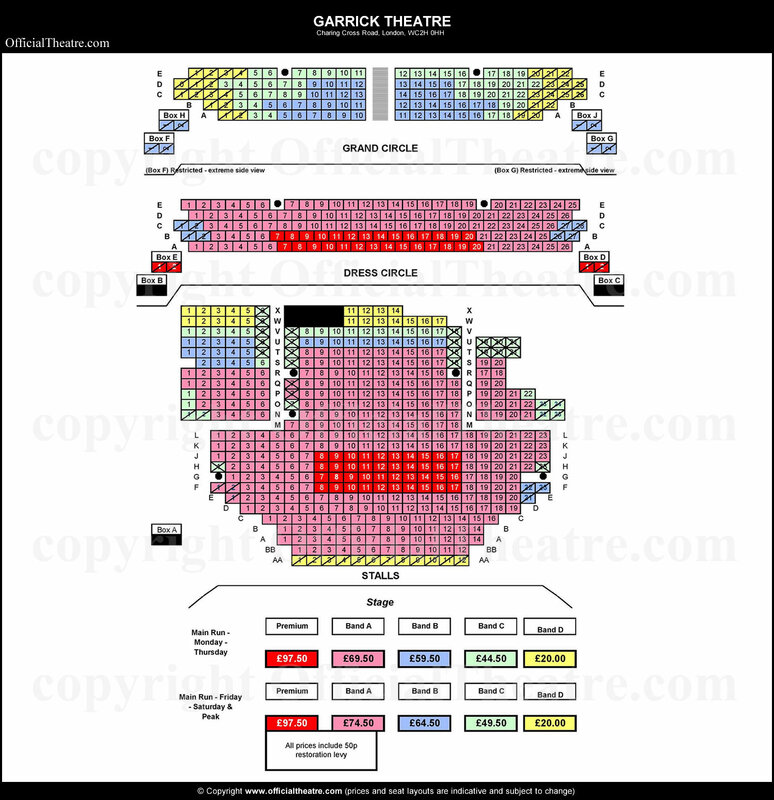 £97.50 (Premium Seats) Premium seats are in the centre of the Stalls, roughly seats 8-17 of rows F-J. These are the best seats in the theatre, offering a central, close-up view of the stage. A gradual rake allows you to see past those in front to a clear, unrestricted view of the whole stage. Seats 7-20 of rows A-B are premium seats, as they give a clear, unobstructed view of the entire stage. You can see all details from here and due to the decent rake in the Dress Circle, the balcony bar does not affect the view. Boxes D and E are also this price, although you may be required to lean forward to see the stage. Not available. £74.50-£69.50 The majority of the Stalls are this price, aside from the very rear rows and seats located directly behind pillars. There are good sightlines throughout the Stalls, although it is recommended to sit in rows C-L to avoid restrictions from the height of the stage or from the Dress Circle overhang. Most of the Dress Circle is this price, as sightlines are good no matter where you are sat. Due to a steep rake and intimate rows, you can see details and avoid the heads of those in front of you blocking the stage. Sit as centrally in the row as possible to have a good panoramic view of the stage. Please note that legroom is limited! Not available. £64.50-£59.50 A handful of seats fall under this price. Seats at the very ends of rows E-F are restricted view as parts of stage right are cut off. Seats 1-5 of rows S-U are also this price as they are partially obscured by the Dress Circle overhang, although this may not dramatically hinder the view. The centre of Row U is discounted as the Dress Circle overhang falls quite low and it is difficult to see detail from here. It is worth, however, purchasing these seats over top price Row T seats, as the view is not much different. Two seats either end of rows B-C are this price as they are restricted view. Due to the curve of the Dress Circle, these seats face the stage side on and are partially restricted by the balcony curve. Occasional moments may be missed from here. Seats in the centre of the Grand Circle are this price as they offer the best views in this seating section. There are no restrictions, but this section does feel distant from the stage. Boxes are also this price, although they are marked as restricted view, due to facing the stage side on. You will need to lean forward to see the stage from here. £49.50-£44.50 These seats should only be chosen if on a budget, as they are behind pillars that are dotted throughout the rear of the seating, which can completely obstruct the view. It may, however, only take a slight lean to see the stage, so these seats could be a good budget option! If you want seats at this price, it is best to sit in the ones further forward and dodge the pillars, as you may find the Dress Circle overhang more of a hindrance! Not available. Seats on the outer edges of the Grand Circle are this price, as the curve of the balcony means that seats start to become angled toward the stage. These can, however, be good bargain seats as you can see most of the stage – it just may feel a little distant. It is worth noting that legroom and comfort is limited up here! £20.00 Row AA falls under this price as it is restricted view, due to the height of the stage. This may not bother some, but can make it tricky to see action at the rear of the stage. Rows W-X are also this price as they are severely affected by the Dress Circle overhang. The rake in seating also begins to even out here, so it may be difficult to see past those in front of you. Not available. Around five seats either end of every row in the Grand Circle are this price, as they are restricted view. They face the stage side on, which can make it difficult to see action happening at the far sides of the stage, and may not make for the most comfortable of viewing. Day Seats (£20.00) Prices will vary for these and seats are given at Box Office discretion. Row AA is usually available for Day Seats. Day Seats are typically top price tickets, therefore Dress Circle seats may be given away at Box Office discretion. Not available.